Welcome to the first issue of the one minute brief, a quarterly e-newsletter aimed at keeping you connected with news and events happening at the School of Law–in a format you can read in one minute (or less). It will be a part of our new alumni magazine, the fine print*, because every good lawyer knows you should always read the fine print. The School of Law faculty has grown by 10, as we continue to strengthen our offerings in key areas such as the rule of law and professional development. 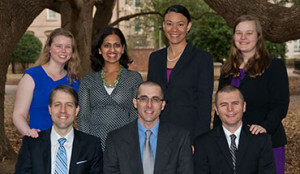 Seven new faculty members (pictured above) joined in the fall of 2012, and this fall, three more will be seen in our halls and classrooms. One of the worst kept secrets (purposefully) is the 2013 class of Compleat Lawyer recipients. However, if you haven’t seen pictures from the awards ceremony on April 25, you can view them (plus share & comment) on our Facebook page or download them from Flickr. You can also watch the video presentations of each platinum winner on YouTube. 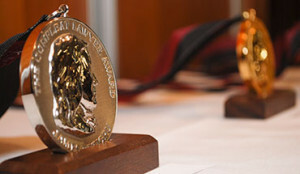 Boston College Law Review, George Mason Law Review and the Michigan Law Review are just a few of the places you’ll see our faculty’s research turn up, as they continue producing highly sought after scholarly works. Here’s a short list of recent articles.